O’Hare International Airport is located within the boundaries of this community area. This community area is the only one that extends outside of Cook County; the western edge is in DuPage County. 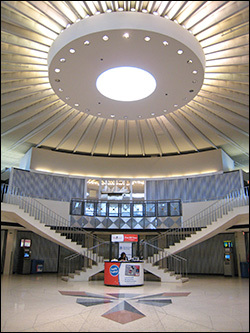 Due to its proximity to O’Hare International Airport as well as major roads such as Interstates 90, 190, and 294, and Illinois Routes 72 and 171, the O’Hare neighborhood is a major business center. Combined with nearby Rosemont, the region serves as an edge city, a major concentration of jobs, shopping, and entertainment. The largest Lutheran denomination in the United States, the Evangelical Lutheran Church in America, also has its headquarters in O’Hare. The Consulate-General of the Dominican Republic is located at 8700 West Bryn Mawr Avenue., Several hotels serving the O’Hare Airport region can be found in the area.